Saturday Shares and 100 Follower Giveaway! My new blog went "live" last Saturday and one week later I'm celebrating 100 followers!! W-O-W! I am so happy to have already met so many wonderful teachers and friends with whom I can share ideas!! So, it seems that celebrating these milestones usually involves a GIVEAWAY! I am all for it! If you know me outside of Bloggyville, you know that I LOVE throwing parties and giving presents! So, I'm happy to announce that I'm giving Rafflecopter a try for some awesome freebies for one lucky winner!! EVERYTHING in one of their classroom theme categories (your choice of theme)! a $25 giftcard from Barnes & Noble!! There are lots of ways to get your name entered in the Rafflecopter to win (see below)! This giveaway will end June 23! On another note, I'm thinking of using Saturdays to share some wonderful finds from the week. My "Saturday Shares" for this week start with a fabulous blog post that I stumbled upon this week. Jodi at Southern Sweetie in Second is a new blogger, as well, and she had an awesome post this week about a workshop she attended. I picked up several new ideas that I plan to implement starting on the first day of school (LOVE the sign language...as I DO feel like I talk a lot in the classroom!). I also learned that I'm an "Echo Teacher" and that is something I need to work on. Take a look at her blog post and tell me what you think. Are you in love with the sign language, too? Are you an Echo Teacher? Has anyone read Rick Morris' New Management Handbook? I'm thinking of purchasing it, but would love feedback first! My next find of the week is actually a YouTube video that I found on Pinterest a few weeks before school was out, but it popped back up this week and I thought it was worth sharing. I fell in love with some of this teacher's techniques and tried them out in my classroom - L-O-V-E! My students absolutely adored blowing "big words" from previous days/lessons into their hands and releasing them together!! It got them all involved and let EVERYONE participate. I also love the mirror technique she uses and the stop and teach-it method. Do you use these WBT (Whole Brain Teaching) techniques in your classroom? Do you have any suggested reads for WBT? I also discovered a blog about Whole Brain Teaching this week, Miss L's Whole Brain Teaching, and she has compiled a list of other bloggers who use this technique. I noticed quite a few of you bloggy friends on that list, so I'm hoping you can share your experiences with this! I'm very interested in trying more of these techniques in my classroom! Remember to enter my 100 Follower Giveaway, and share about it! I am a follower and love your blog! I'm thinking of using monsters in my class this year also! Congrats on 100 followers (actually 102!!) I love your ideas, especially your mini offices that I saw the other day!! Thanks for sharing your ideas. Amanda, I found your blog from your comment on Linda's "Primary Inspiration" blog. I just became National Board Certified myself - go team! :) I'm going to check out Teacher's Clubhouse and Lightbulb Minds as soon as I finish this post. If you have a moment, I would love it if you could come check out my blog. Oh, and I'm your newest follower. I also added your blog button to my blog. I just discovered your blog! I'm loving it! Wow, congrats on getting to 100 followers so quickly!! I am a follower. 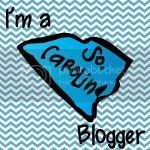 I'm also a new blogger, and now I'm your newest follower! I just got started a few weeks ago. I'd love for you to stop on by! Thank you for doing this giveaway! Too cute! Welcome to blogland. Congrats on 100 followers! I just found you, and I am following you now! I'm a big advocate of whole brain teaching, and implement it in my classroom. I just reached 300 followers, so I'm having a big giveaway. Be sure to come by to check it out! I'm a follower and have been using WBT for 3 years now! LOVE it! I just discovered you're blog! Awesomeness! Yay!!! 100 woo hoo!! I was soooo excited to see my post mentioned!! Thanks for sharing All of these great ideas! I love this idea of sharing other's blogs on Saturdays. Have you considered doing it as a Linky party where everyone can share what they find? I may never leave the party if you start it!! :) great job! Congratulations! Yay!! Over 100 followers! Congratulations on getting to the big 100 in such a short period of time. That is very telling! Precious blog! I now follow! Teacher's Clubhouse is pretty neat , too! Congrats on 100! I am a follower! Congratulations! Congrats! I follow your blog! I just found your blog. Congratulations!!! Congrats on your new blog! Wow, 100 followers already, that's fantastic! I love your cutie patootie blog! I am now your newest follower, congrats on 100! I am a new follower! Congrats on 100 followers! Ooohhhh. Congrats on your blog! I will add it to my blog the next time I'm on my computer! I'm now following you Amanda! Congrats on your successful blog! I am a new follower! Love the whole brain video post as well! Yay for 100 followers ! I just very recently created my own blog...but it is a work in progress. I am in the "building" stages...haven't even made my first post yet ! I hope I win the contest because I have lots of resources from Teachers Clubhouse. I can't ever get enough ! 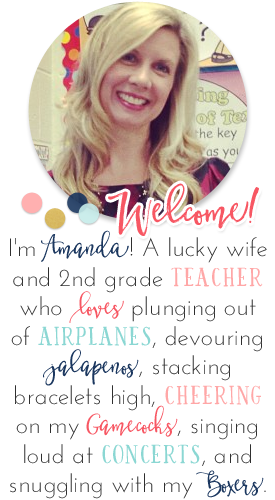 Amanda, I love your blog...soooo cute! Thanks for finding mine and leaving a comment. I am a new follower of course!! I just saw the WBT video myself not long ago and I am so intrigued. I want to learn more. I'll be checking back daily to see what you've done! I'll be blogging about your blog as well! Just jumped on as your newest follower - congrats on the 100+! I am a follower. Congratulations on 100 followers! Love your blog...am a new follower! Will have to reconsider monsters as a theme...didn't even like them till I saw what you'd done! Wow! Just found your blog and I must say I'm a new follower. 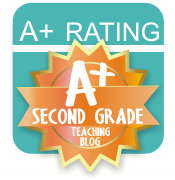 I'm lovin your lesson plans post! Hey! I've been a follower for a little bit! I've been trying to get followers on my blog, but I can't get it as quick as you! Good work. Any advice? I follow your blog and love your monster ideas! I just found your blog through Courtney's post and I'm so impressed at the success you've had. Congrats!!! I'm new at blogging too... it's so much fun!! Holed molee! I've been blogging since January and just this week I passed 145 followers. You must be a-maz-zing! I'm your newest follower! I'll be back! Wow, that is so amazing! 100 followers in one week?! Congratulations :) I'm your newest follower! I also use whole brain teaching in my class! If you check out their website, there are a ton of free resources and videos! Every Tuesday night they also have webinars that you can watch and I believe even receive pd credits for! I my Gosh! You are one of my teacher idols! How did I not know you had a blog!! Yippe! Teacher's Clubhouse is my got to at all times! Not to mention you site! yayay! Congrats! You may reach 200 followers before you know it. Great blog. I love it. I'm now a follower of your blog. Love it so far! Yay! I am so glad you a re blogging now! I am your newest follower (sorry for the delay- a whole week?! I was out of town!). Blog looks great!!!!!!!!! Congratulations on your 100 followers! I have enjoyed reading all of your posts so far. Congrats on your new blog! Can't wait to keep reading your new posts. What a great contest and congrats on your first 100! I am one of your newest followers!! Congrats on 100 followers! I'm your newest one. Thanks for visiting my blog! I hope you find what I post about using Whole Brain Teaching helpful. Be sure to check out the webcasts on the WBT website. There will be a new live on on July 3rd, but for now you can watch all the older ones. I just found your blog and have been reading and checking out so much information! Wow LOVE the info and stories!! Congrats! Glad I found this blog. Wow! You have been blogging for two weeks and are already at 200 followers! That is CRAZY! Congrats on 100 followers! I just hit that milestone too.I'm a new follower! 100 followers! Good for you! Thanks for stopping by my blog. I don't know anything about whole brain teaching, but I'm gonna check it out! Thanks for sharing! Congratulations on 100 followers....but you're more than double that now!!! Yea! I'm your newest follower and I love your blog! Congratulations on 100 followers! I am your newest follower! We are your newest followers! Congrats on the new blog and crazy amount of followers--so fast! Congrats on reaching a milestone. I'm a follower! WOW! One Hundred followers so quickly... that's awesome! 300 Follower Giveaway and Linkup!! Whodunnit? Kicking The Year Off With Mysteries! Sundays in the South: I Sell Gold!